In my previous post, writing about John Constable’s oil sketches, I noted how he would make meticulous notes of the weather conditions at the time he painted. 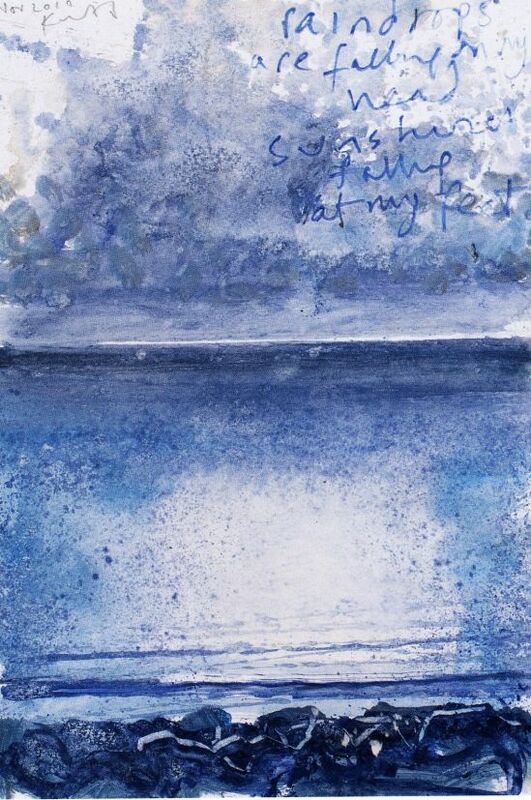 I remarked that this reminded me of Kurt Jackson, who does exactly the same thing – often including the observation in the title of a painting, and sometimes inscribing the annotation on the painting itself. (In the example above, he does both.) The day before seeing the Constable exhibition at the V&A I had been to the Redfern Gallery in Cork Street where, downstairs, there were the remnants of a display mounted by the gallery to coincide with the publication of Kurt Jackson Sketchbooks, in which – interestingly in the light of the V&A’s exhibition of oil sketches from Constable’s sketchbook – Jackson asserts that his sketchbooks should be regarded as seriously as his paintings, prints and sculpture – as a body of work in their own right. The book draws on a selection of twenty sketchbooks, all of them from 2007, and offers a rare insight into the mind of one who I regard as the most important living British landscape artist. Compelled to draw every day, Jackson would never contemplate travelling without pens, pencils, paints and some kind of sketch book. Indeed, in the first chapter we accompany Jackson on several train journeys as he guides us through the drawings, paintings and collages that he makes as he travels – some of his wife Caroline sitting opposite. We begin to see how Jackson’s sketchbooks are vital to the development and completion of his paintings. A hastily drawn image helps him to work out what he wants to achieve on canvas, or simply captures something when there isn’t enough time to paint or draw properly. 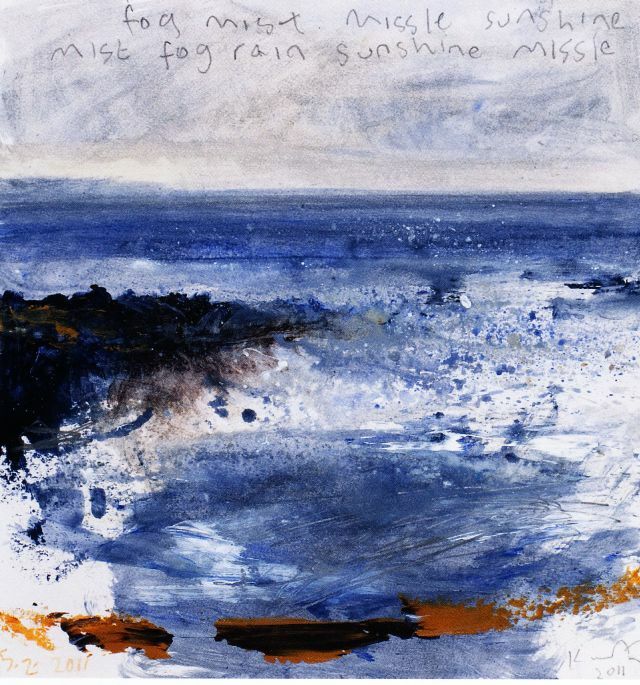 Like many other artists, Jackson regards his sketchbooks as an invaluable visual diary of his life (the book opens with a quotation from van Gogh: ‘My sketchbook is a witness of what I am experiencing, scribbling things whenever they happen’). The book consists of a series of narratives written by Jackson in which he guides the reader through sketches made on journeys that have yielded several series of paintings – from the Scilly Isles and the Cornish coast to the Glastonbury Festival, the river Dart, Jura and the Ardnamurchan peninsula in Scotland, France and a grand voyage by train to Greece. I’m sitting outside the boathouse, my hut on Priest Cove. It’s a tatty, ethnic vernacular shed constructed out of driftwood, beach stones and corrugated iron, one of a series of similar buildings terraced up the cliff and around the foreshore of the cove, built by and for generations of fishermen. I use it as one of my studios, damp and full of rodents and wrens and ferns, but providing me with shelter from the harshest of elements and the most curious of visitors. I sit on a green plastic suburban garden chair, and stare out at the horizon and the glare of the Atlantic. My pencil follows the skyline, straight as a ruler, which joins Land’s End’s distant promontory, then drops down onto Carn Gloose’s jagged lion’s head of a granite cliff, before dropping into the cove. I continue along the foreshore with its round, dinosaur-egg boulders and pebbles and those angular rocks, bisected by the straight-edged, man-made slipway. A continuous line of pencil that leads the eye semicircularly from sky to water’s edge. A thousand drawings and doodles have happened here, a thousand paintings over the last twenty years or so. Sketchpads full of my time invested in this one place; days and days pressed between the hand-worn covers. This place has become the focal point, the muse for a lot of my work, with the seasonal, tidal and diurnal changes and subtleties; the local fishing activities, the visitors, the fauna, the flora: Porth Juste Cove, Priest Cove, ‘the cove of St Just Cove’. I turn over the page; my pencil follows the edge of an incoming wave, rolling into and across the cove then playing with the water’s surface – a tracery of lines – the sea’s surface, the light reflecting off it, the patterns formed by the foam’s backwash and swell, swash and wash, the agitation and effervescence, the stripes and streaks, squares and circles. There’s the constant motion of the water the persistent wind, the clouds drifting in from the Atlantic; then there’s a pair of crows rooting together amongst the rock pools. A crying gull sweeping past and a brief visit from a family of excited, excitable choughs, squeaking like a kiddie’s toy. All this is woven into my tangle of lines, strokes and marks some spontaneous, some careful and following detail, an observation, and my intimate awareness of this place. Bees buzz in the vetch, grammersows crawl over my feet, sea beet and spleenwort move in the breeze. Another page, another medium. 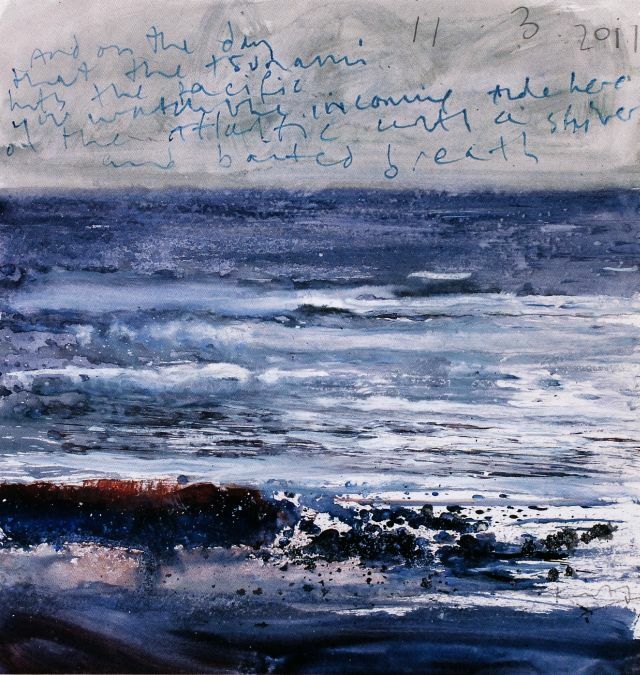 A splash of watercolour, the pooling and puddling of clouds; a sweep of the Atlantic, some drips and dribbles off the palette to locate and define the water’s rocky edge; paper-white breaking surf. I pick up some scraps of paper, the remains of my previous visits from off the floor of the huts stained with the ochre earth of Cape Cornwall and the rainwater and seawater seeping and dripping into my semi-porous hut. Collaged onto the page, they replicate the geological textures and forms out there in front of me. Granite, greenstone, mudstone, basalt, veins and lodes of ores and quartz; recently sea-broken and exposed rocks, sea-worn and smoothened stones. Erosion and … so much information, so many other processes – an ecology of interlocking worlds and times how can this all be put on one page; captured and celebrated, noted and described? Ink, pastel, crayon, pencil, glue, gouache, acrylic, watercolour and collage; an eclectic diversity a desperate scramble and scrabble to attempt to reign in this diversity around me, into and onto my page. 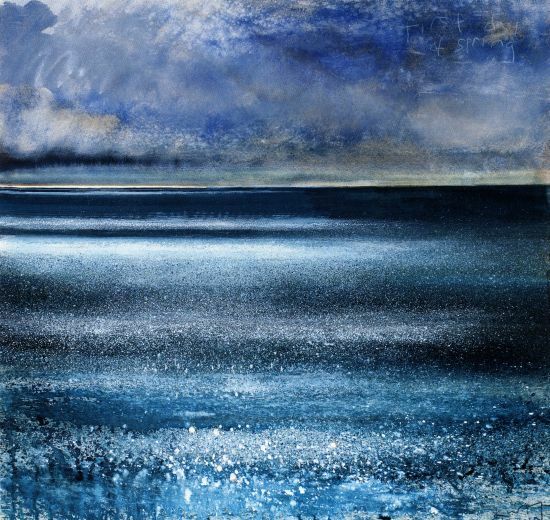 A plethora of seaweed greens and browns, communities of tinted shellfish, rock pools of intensity and sparkle, dots and dashes of pure-earth pigment. Glassy basalt, vivid orange granite, dull mudstone; gunmetal grey ocean, marine blue, sea green. Pipit tweet oystercatcher scream, raven honk. Sea whisper, murmur, mordros. This most ordinary of coves has slowly and gradually fixated my attention, fascinated and taken hold of me to become a place that’s extraordinary, rich and full, an inspiration a source. It has stamped its personality on my work, and I in turn have added my signature to its bottom right-hand corner. The chapter is illustrated with examples of the sketches Jackson has made at Priest Cove – several, as shown here, inscribed with details of the weather conditions prevailing at the time. 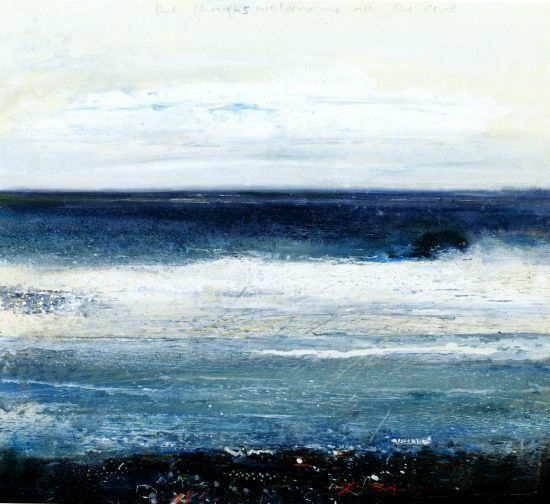 One, made on 11 March 2011 is inscribed, ‘And on the day that the tsunami hits the Pacific you watch the incoming tide here on the Atlantic with a shiver of bated breath’. In an informative introductory chapter, ‘Between Artist and Place’ Alan Livingstone discusses key aspects of Jackson’s working practice and his approach to his art. He notes that, like many artists, Jackson is very particular in his choice of sketchbooks (interestingly, some are square – the format of very many of his paintings). Livingstone observes that, in addition to drawings and paintings, the sketchbooks also contain mixed-media collages that include materials such as menus, tickets and scraps of newspapers, glued in with Pritt stick: the ephemera enhancing Jackson’s record of the moment. For Jackson, drawing is of central importance, and Livingstone notes the deep pleasure that the artist takes in constantly honing his drawing and observational skills. The book contains many examples of the clarity and economy of Jackson’s line drawing, ranging from a minimalist drawing of White Island in the Scilly Isles – comprising no more than half a dozen lines in coloured crayon over a watercolour wash – to drawings of his wife made on a train journey, and the detailed observation of a water shrew discovered dead in his garden. Amongst the many fine rapid impressions is this one, of Orwell’s old hideout, Barnhill, on Jura made in May 2011. Livingstone discusses what is perhaps the most striking characteristic of Jackson’s work – his marked emotional response to ‘place’. Consistently and over a long period of time, he has shown an affinity with a number of favoured locations – the far west of Cornwall, but also English rivers (such as the Dart, the Stour and the Avon), and places in France and Greece to which he has returned repeatedly. The sketchbooks reveal drawings of the same place, recorded at different times of the day, under variable weather conditions. There may be scribbled notes on particular trees, hedges, or birds. As Livingstone observes, nothing is too small to escape the close attention of an artist with a degree in Zoology. 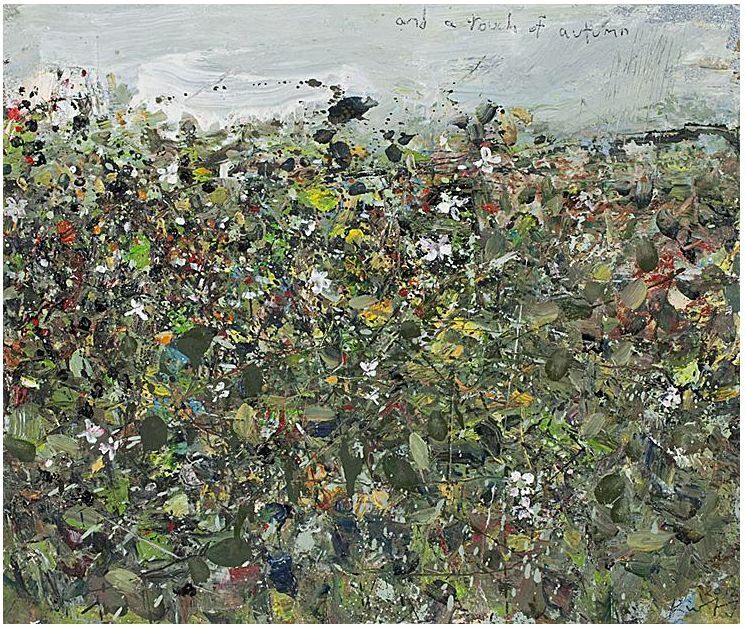 Like John Constable who believed that ‘art is to be found under every hedge and in every lane’, Jackson works outdoors, going to nature at its source to record changing weather patterns and every small detail of the local environment. Livingstone compares his attitude to that of Andy Goldsworthy, who believes that his work is ‘so rooted in the history and soul of a place that it cannot be separated from where it is made’. Two paintings on show when I visited the Redfern Gallery demonstrate this aspect of Jackson’s work. 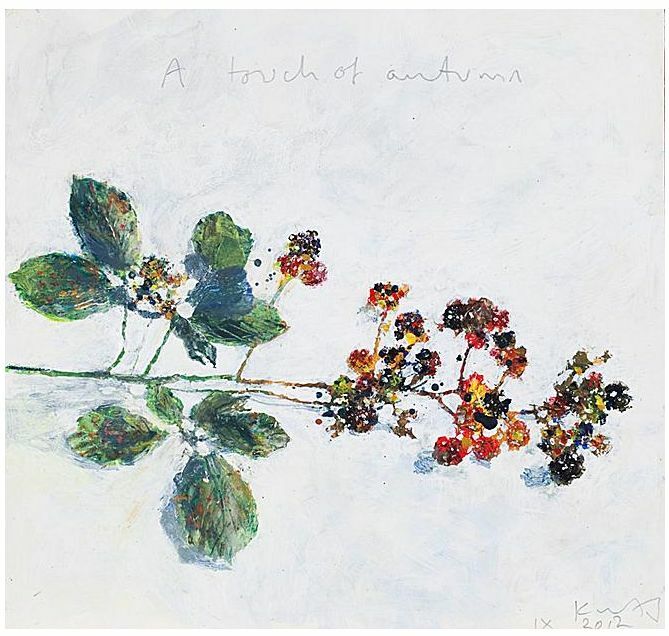 And a touch of Autumn zooms in on a section of Cornish hedgerow, portrayed as a patchwork of colours, while Sunshine seed time, with it masses of grasses, seed heads and umbelliferae reminded me of Durer’s study of a clump of turf. Wild, ever changing and remote. ‘The relationship between artist and place is unflinching, with no quarter asked, no quarter given. Working from his boatshed studio. he finds endless challenges in recording the extreme variations in the dramatic conditions that affect this primitive Celtic landscape. Determined to record the highs and lows of each visit, Jackson believes it is fundamental that his response is honest and totally derived from the experience of ‘being there’. 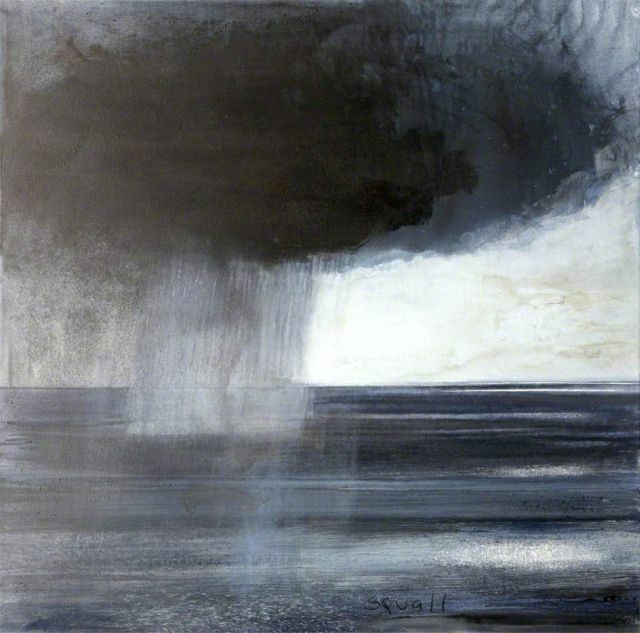 A good example of the art that emerges from such a commitment might be Squall, a painting that, suitably, is now in the possession of the Met Office. 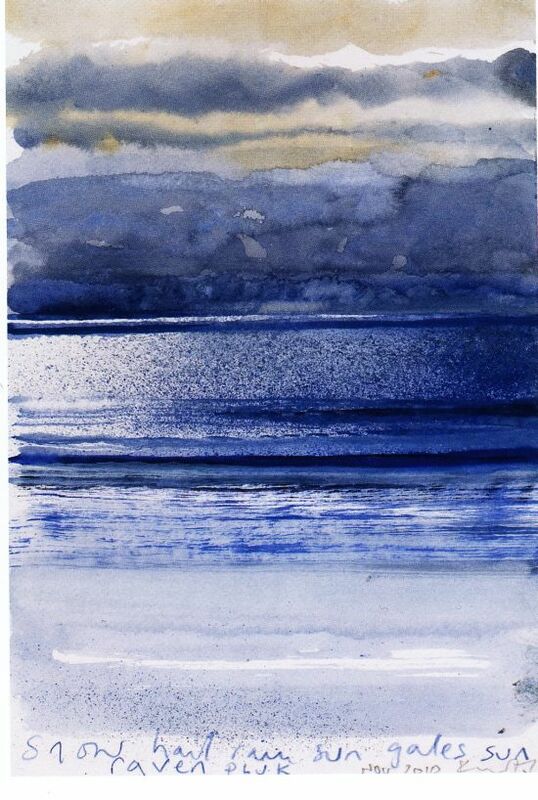 Endlessly fascinated by the complex visual effects generated by light fleeting across water, Jackson has persistently ‘confronted’ the sea and attempted to record and glorify the timeless mystery of sky and sea coming together on the horizon. In formal terms, the seascape provides a limited range of timeless compositional options. In addition to the size and shape of the canvas, the key artistic decision relates to the proportionate horizontal split between sea and sky. Jackson’s constant experimentation with these proportions, and therefore the positioning of the horizon, heightens the drama of the scene and challenges the spectator to assess and reassess their viewpoint. 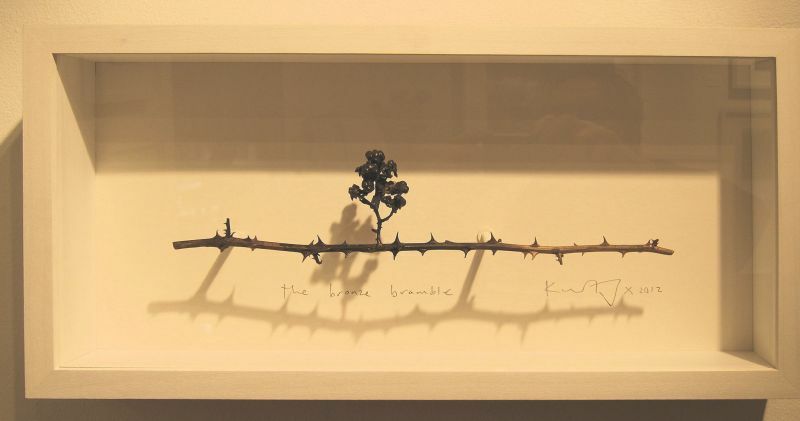 Over the last 20 years or so my work has evolved into ‘projects’ – each a body of work that explores and is inspired by a particular route [a river, a prehistoric track way], a workplace [quarry, mine, fishermen, farmer], a group of fauna or flora [the crows, the trees] or as in this exhibition, a particular place. A dedication to and celebration of the environment is intrinsic to both my politics and my art and a holistic involvement with this subject provides the springboard for everything I make. My practice involves both plein air and studio work and embraces an extensive range of materials and techniques. This project is about the place where I live – in the far West of Cornwall. This is the most Westerly town in Britain and the furthest town from London outside of Scotland. It is a wild place, a place on the margins; geographically isolated and battered by the elements. It is a post-industrial town in a post-industrial landscape, with a fading fishing industry, a struggling farming community and an expanding population. Nevertheless, it is a beautiful place, a landscape of granite in the transitional space between the Atlantic cliffs and the Cornish moors. Like all of my artistic practice I approached these issues from an environmental perspective – I feel that successful environmentalism stems from a need to source from, and be faithful to the local community and the surrounding biodiversity. At the Redfern Gallery, there were several still lifes, made last autumn, which reflected Jackson’s commitment to detailing the local environment through the changing seasons- with an additional touch of humour. 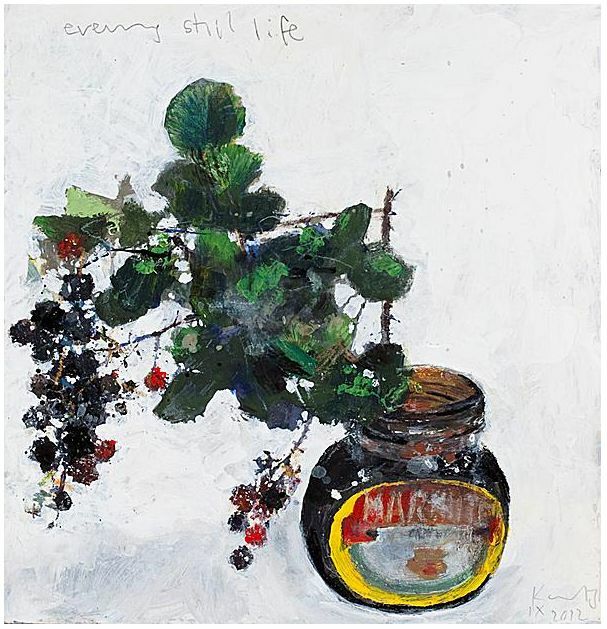 Sprigs of brambles adorned with blackberries were a focus of Jackson’s attention last autumn, and he painted several inserted into empty Marmite jars. When the blackberries appear you know that summer is coming to an end; when the blackberries have been spat on by the devil, you know winter is on the way. Along with the leaves changing their colour they are the archetypal sign of autumn. Being the last wild food still gathered by everyone they symbolise that contact, that connection with the seasonal rhythms of the countryside still hanging by a thread here in Britain. With their vivid unripe scarlet and crimsons contrasting with the indigo and black ripened berries; the viridian leaves in their repeating threesomes and those off white almost pink delicate petals framed and protected by the crisscrossing lattices of briar and bramble – this is where the whitethroats nest and the bees buzz; so much to be drawn into, so much to paint. Same here – this a fabulous selection too. Thanks for bringing these together for us Gerry. 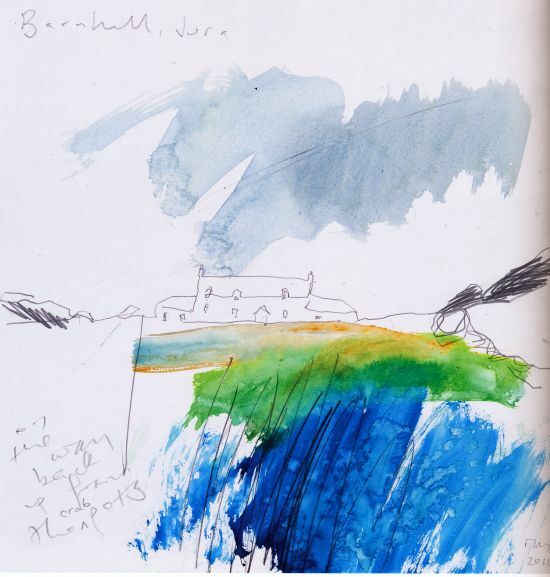 I especially like artist’s sketchbooks as they have a spontaneity that sometimes gets lost in finished works – as with Constable of course to some extent! 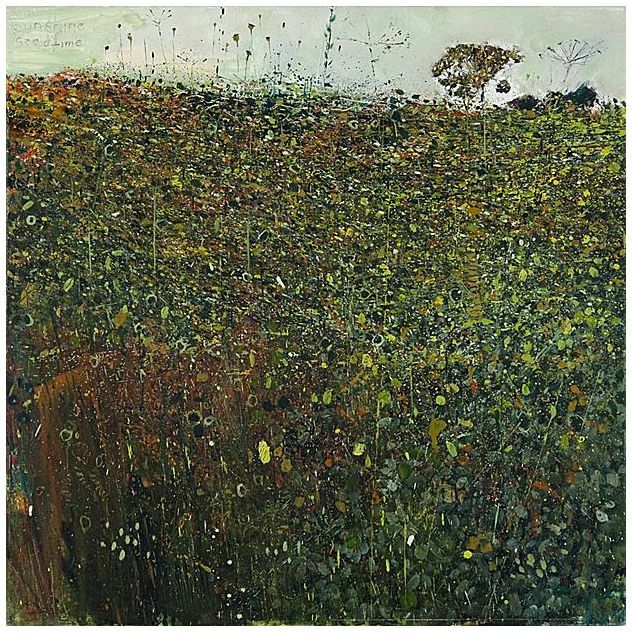 In my ignorance I did not know Kurt Jackson’s work. It is simply stunning. Thank you for the introduction.